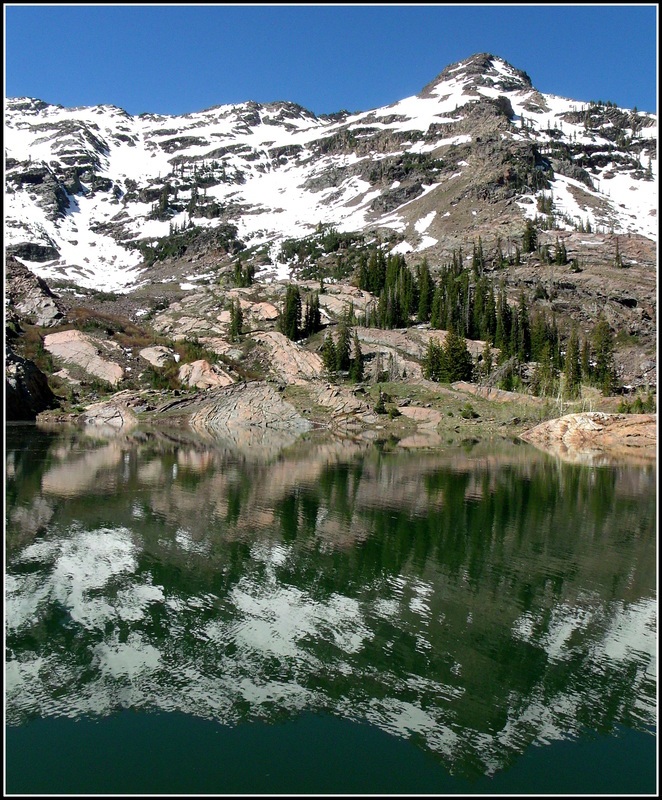 Sundial Peak and Lake Blanche…. 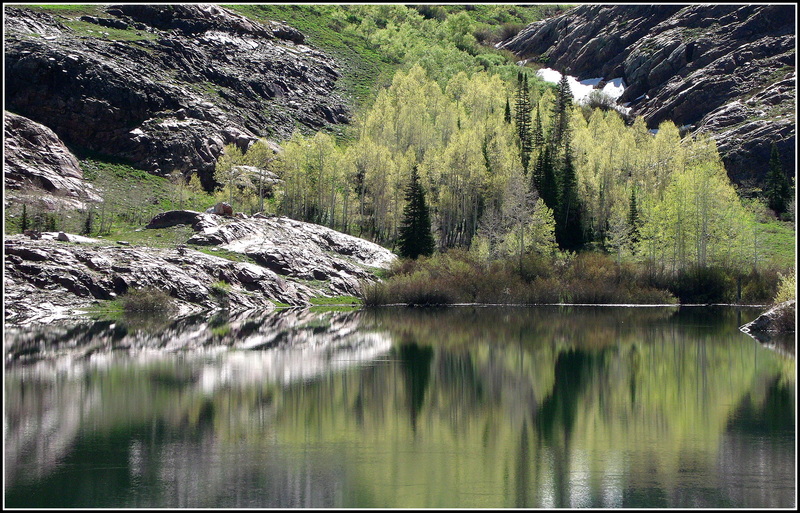 One could probably say that I’ve been guilty of overdoing things with my posts on Lake Blanche and Sundial Peak, so I’ll keep this one to a bare minimum and only post one photo from my most recent trip…although it’s been more than three years since I have been able to make the hike up there, so I should probably lay it on thick and post something like 20 or more photos…. Anyway, here’s the postcard image with the little people included so you can appreciate the grandness of the place…. 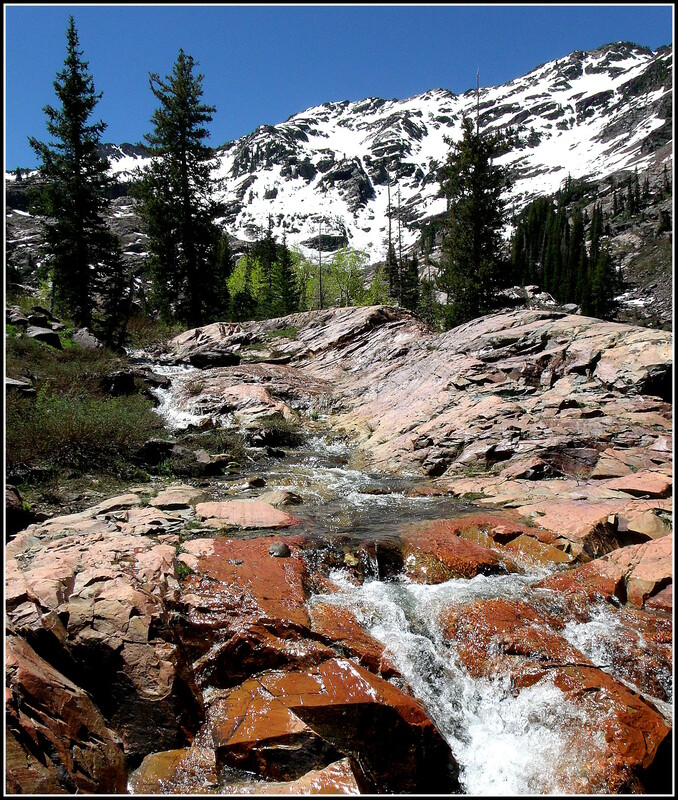 If you’re relatively new to the blog, you can start here in viewing other posts on the lake and it’s surrounding area…or you can scroll down a little bit past this post, find the “Search” widgit, and enter “Lake Blanche” or “Sundial Peak” into that feature to be presented with a veritable list of options for seeing more of the place. 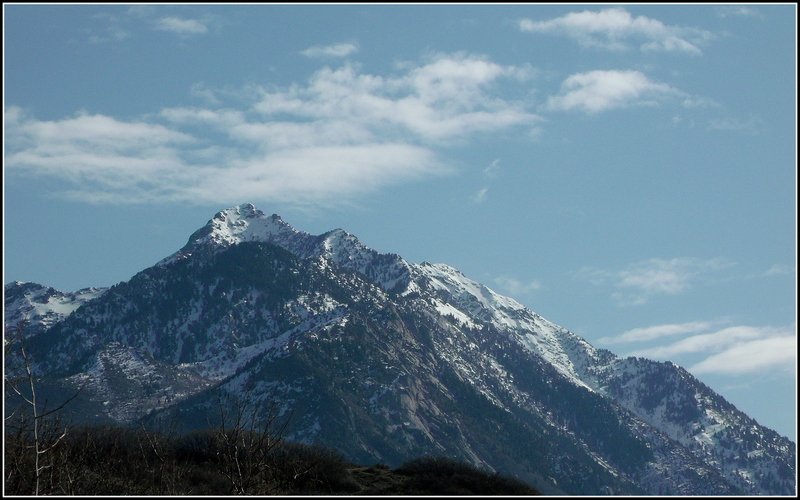 Mt Raymond is easily recognized from many locations within the Wasatch Mountains. 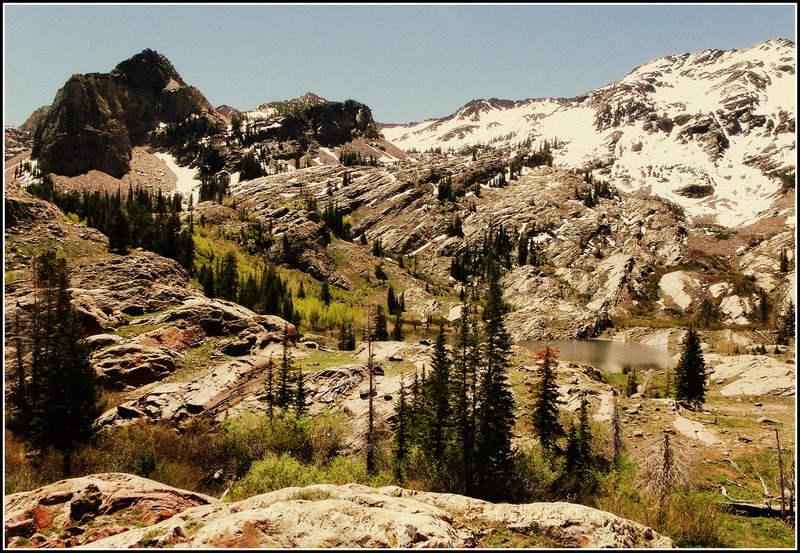 You might remember that there are three major canyons in the section of the Wasatch range that forms the eastern geographic boundary of Salt Lake City…Millcreek, Big Cottonwood, and Little Cottonwood…from north to south…and they all lie in an east/west orientation. 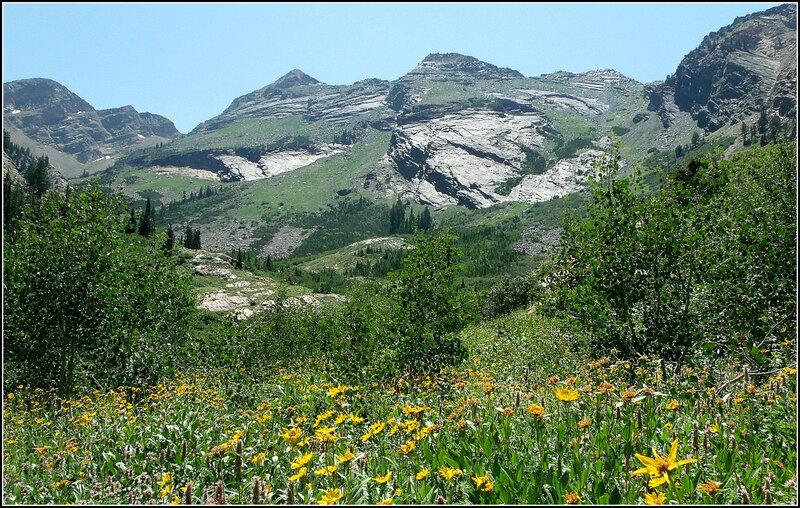 Mt Raymond lies somewhat near the middle of the ridge that separates Millcreek and Big Cottonwood Canyons. While I had hiked around it three times and had stared at it so many more, I had never set-out to actually climb to the top of it…until the end of October of this year. 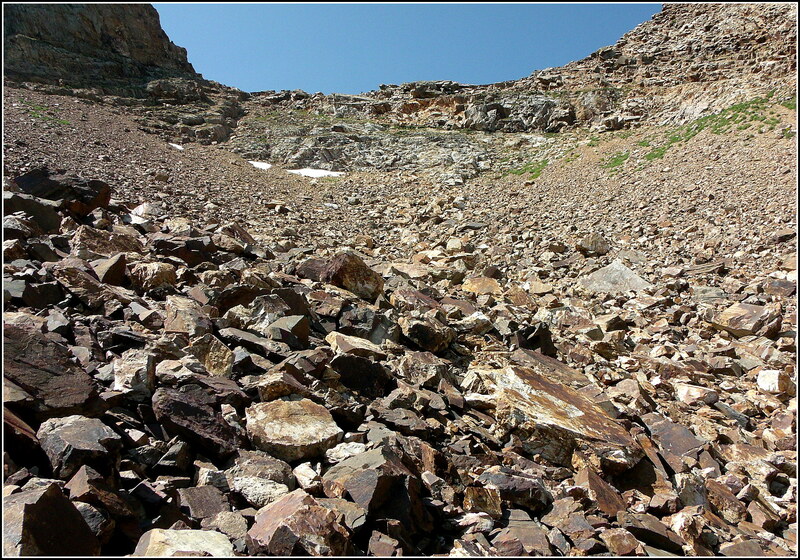 This post doesn’t highlight the hike itself…it shows what can be seen from the trail up to, and from the summit. If you’ll click on any of the images in the gallery, you’ll be taken to a slide presentation that includes additional orientation-related commentary with most photos. 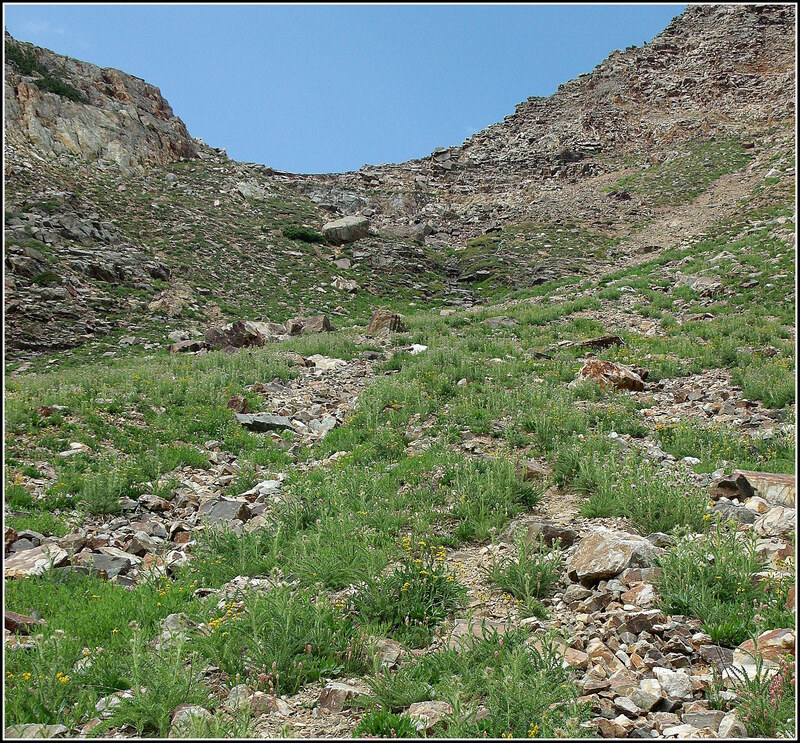 You might remember the zig-zag trail from other posts. This is where you find Lakes Blanche, Florence, and Lillian. Twin Peaks to the right with the “U” shaped saddle just to the left of them. 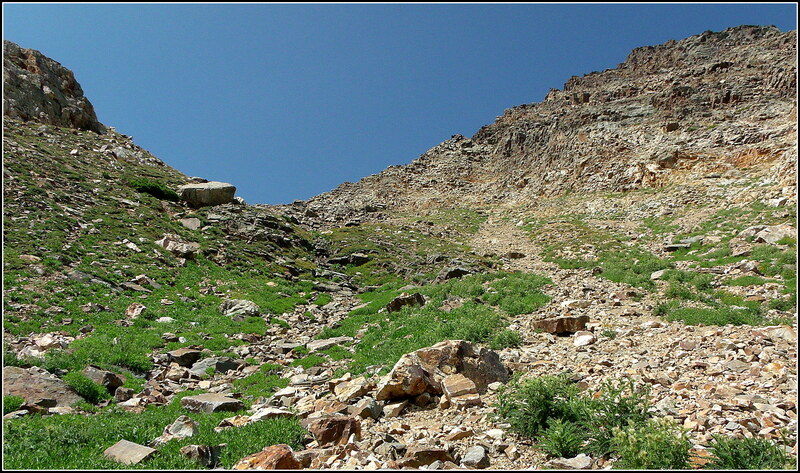 Mt Raymond summit at 10,241 ft. Looking northwest…the blue is the Great Salt Lake…with a very low water level…the white is the lake-bed that is usually beneath several feet of water. 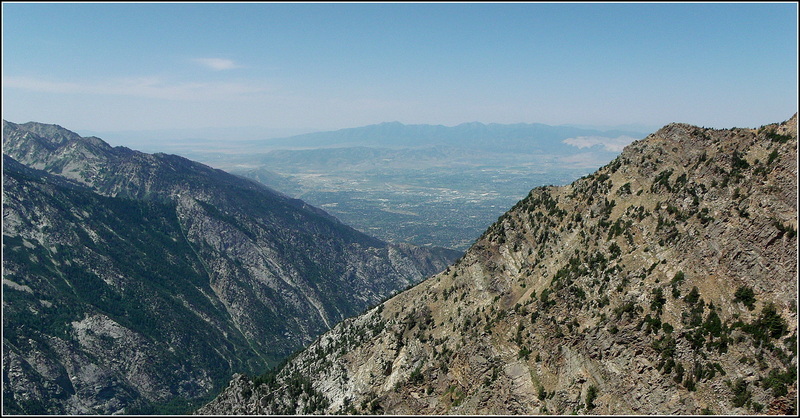 The most prominent peak of the Wasatch Mountains that form the eastern geographical boundary of the greater Salt Lake Valley is actually a set of peaks named “Twin Peaks.” There is only a two-foot difference in their elevation and they lie in a somewhat east/west orientation and are often referred to with the designations of “East Twin” and “West Twin.” Located about 100 yards apart, the peaks measure 11,330 and 11,328 feet respectively, east and west, and rise approximately 7,000 feet from the valley floor. You might remember a photo similar to the one below in my post “It’s great to be alive in the West” from March of this year. 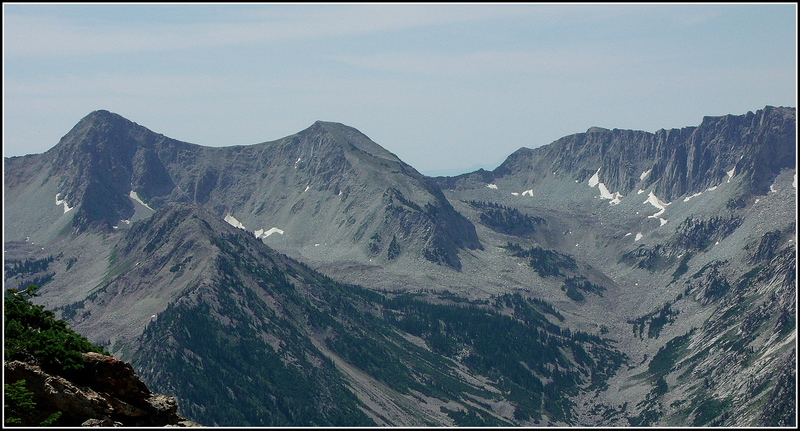 When I made this photo, I was located about 4-5 miles south of the front, or western face of the mountain, so we can only actually see the west peak from this view. 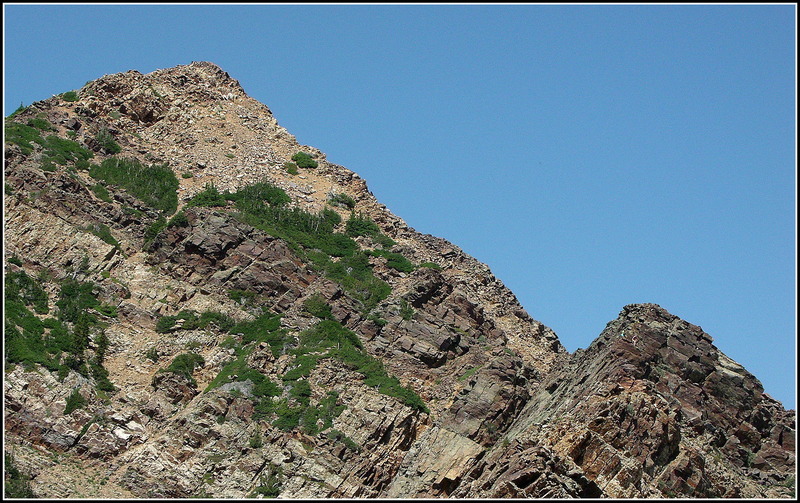 The peaks are often referred to as the Broads Fork Twin Peaks, as this is the most common approach to the peaks…and the below photo shows what they look like from Broads Fork. You might remember similar photos from my two posts on the area last summer. 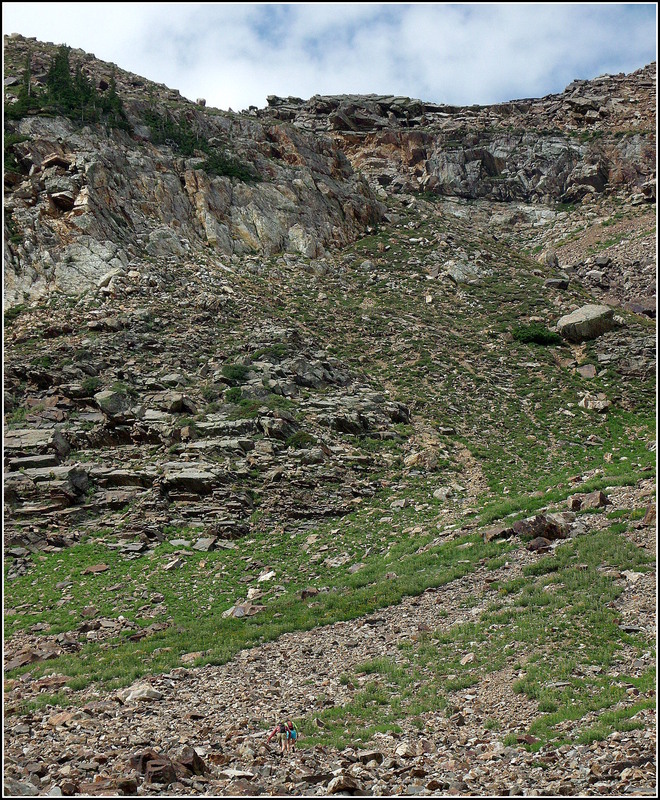 The saddle is located in the deepest part of the ridge-line toward the left of the image…which is still a bit of a hike from the beaver pond. 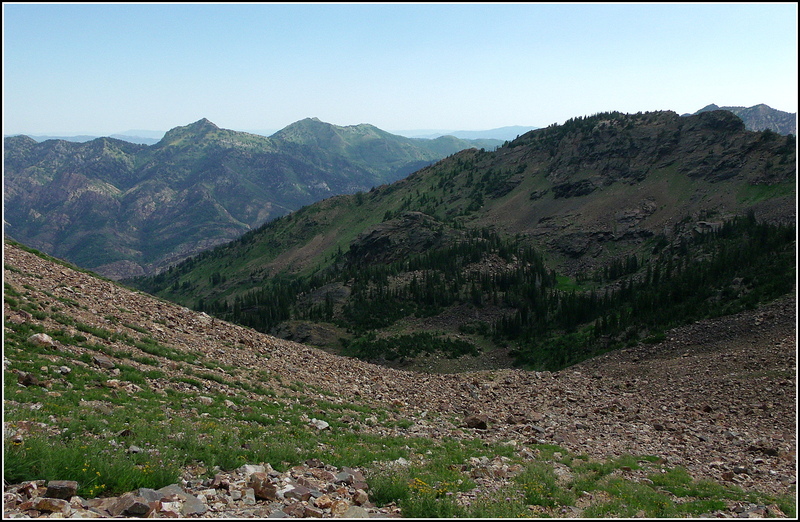 This is Sunrise Peak to the left and the southern edge of the west Twin Peak to the right…with the saddle right there in the middle. And this photo below is right about where I ended my foray into the area last year…it should be photo #8 in the post, “Broads Fork – Part II.” Actually, I think I was a little further up the trail last year…about where you can see the people…to the right of the left-leaning stick, just down from the mass of trees…just left of the middle of the image. There’s a man and woman toward the bottom of the below photo…the woman is wearing the neon green shirt and turquoise shorts…we’ll see them again later…. 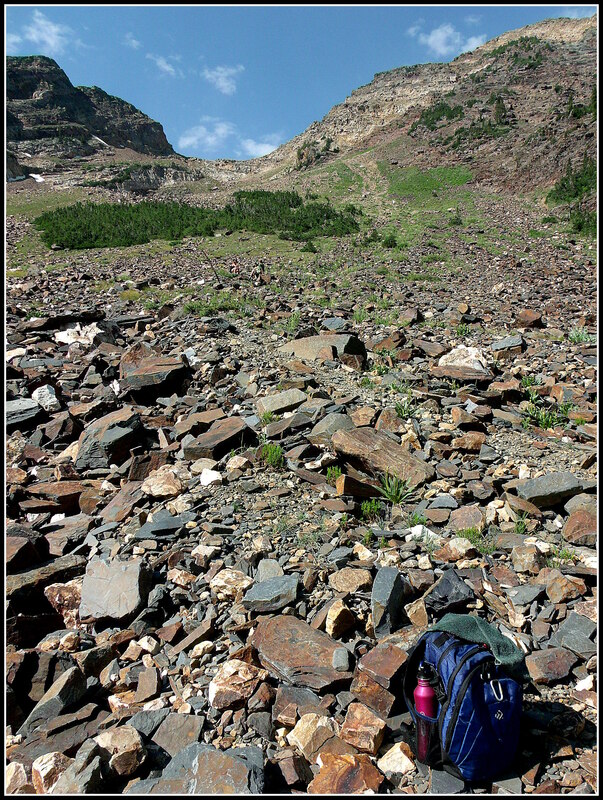 We can still see the woman and her neon clothing in the below image…just down a little and over to the right of the huge rock that is a little ways below the horizon…if it’s hard to find her, keep the rock and where the woman should be in the center third of the photo…. She’s there…. 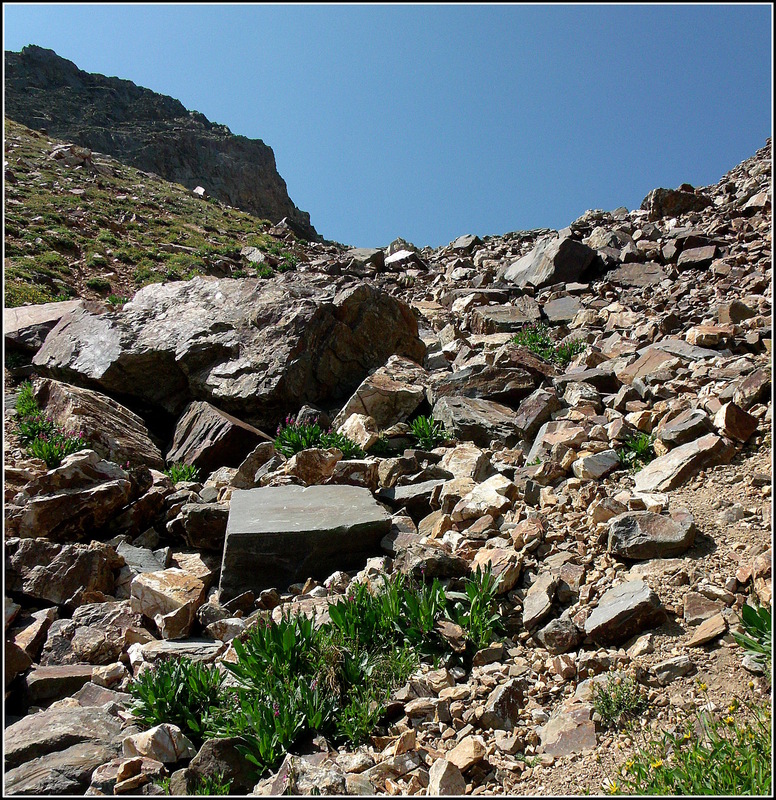 About one-third of the way up the slope, I was wondering if I was crazy…wondering if I really needed to keep going upwards…so I found a flat stone for a seat and turned around while I had another drink and an apple…….wondering….. If you noticed the yellow hue to the side of the highest peak toward the left of the above image, here’s a closer look at it…from miles away, literally, you can see the color of thousands (and millions?) 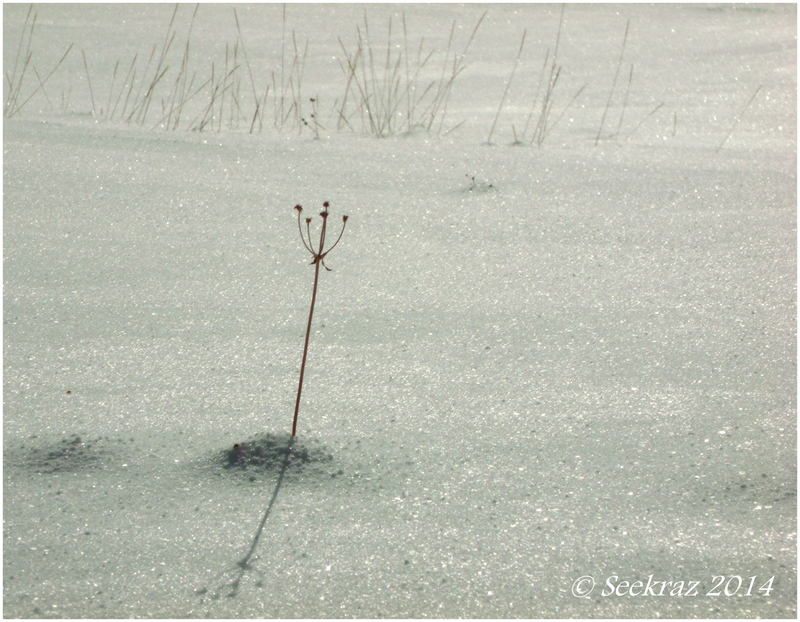 of sunflowers that covered Mt. Raymond…some of which I have already featured here. One can only sit on the side of a mountain for so long eating an apple and having a drink before one has to decide whether to keep climbing up or to head back down to the truck…so I turned and looked up again…and up again…and figured “What the hell,” and kept climbing…one step at a time…this isn’t a race, right…….? And you can tell that we’re looking UP, right? There’s a bit of a trickle of water in that darker spot…down and to the right of the big rock that is now on the horizon…. How many of you have been to a gym or fitness center and tried their “Stair Master?” We’re still looking UP in the below photo…. Remember the man and woman from the earlier photos? 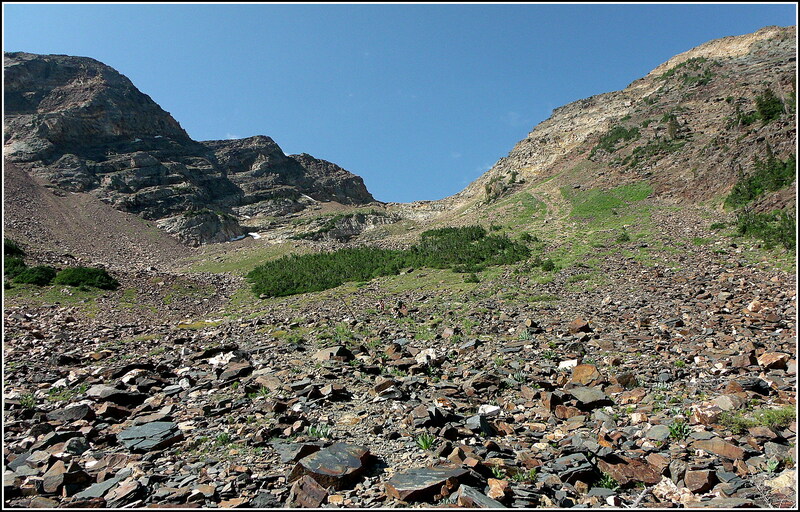 I had asked them if there was a clear trail to the top…the woman said “yes” and the man said “no.” He said there’s no trail, but “you’ll know where to go.” It seemed that I needed to head toward that bit of a notch in the rock between the middle and left spots of snow…. 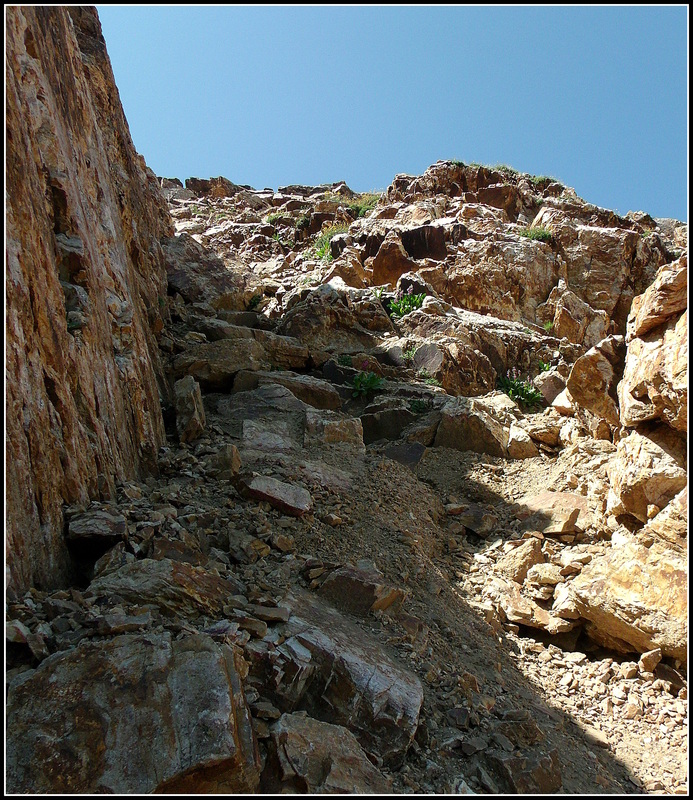 In the notch now and still moving upward…hanging-on to cracks in the side of the rock, scrambling on hands and feet…. 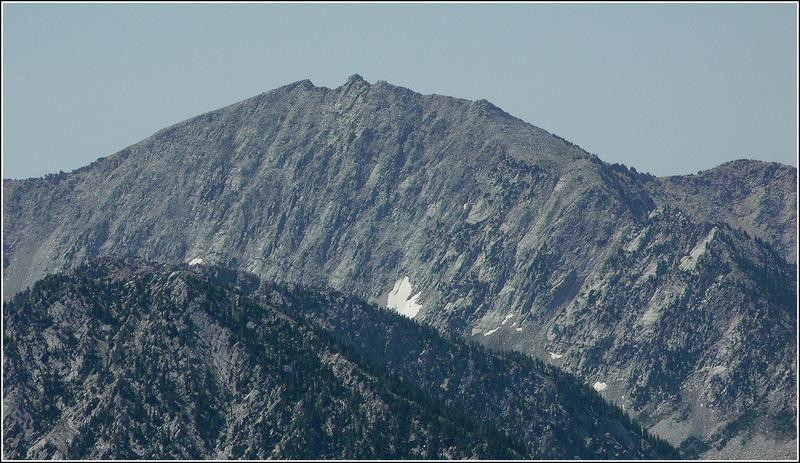 Looking toward the right of the notch…the lighter peak is the west twin…. Wow! 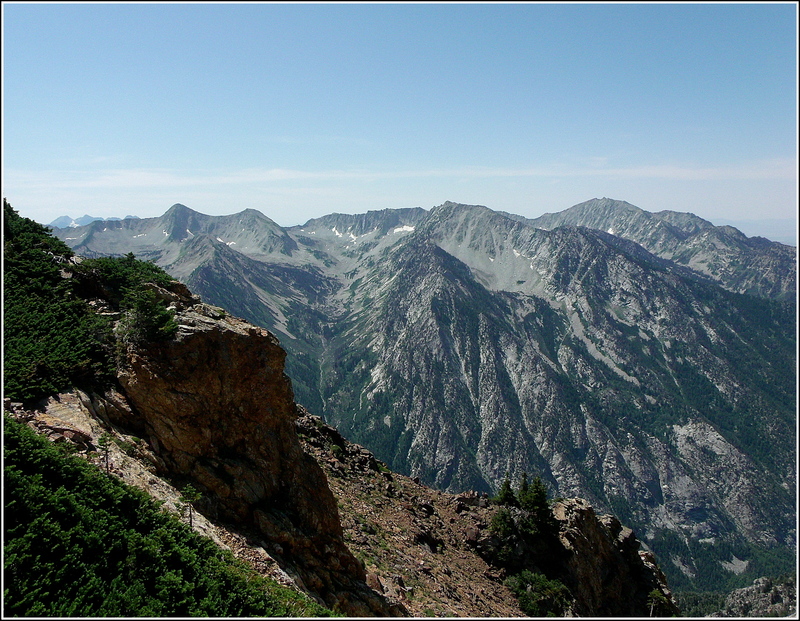 Looking toward the south, I see the southern ridges of Little Cottonwood Canyon…. 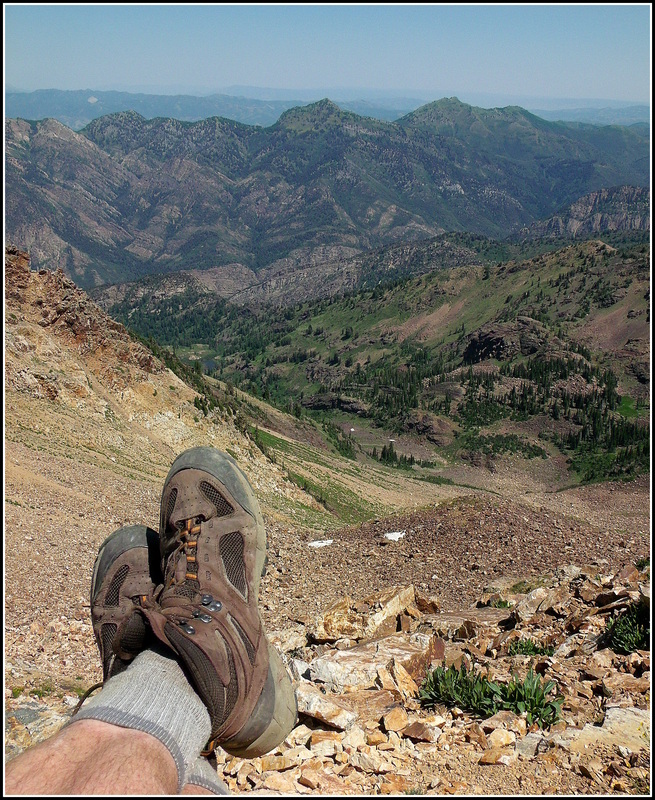 …looking toward the west I can see out over the Salt Lake Valley…. 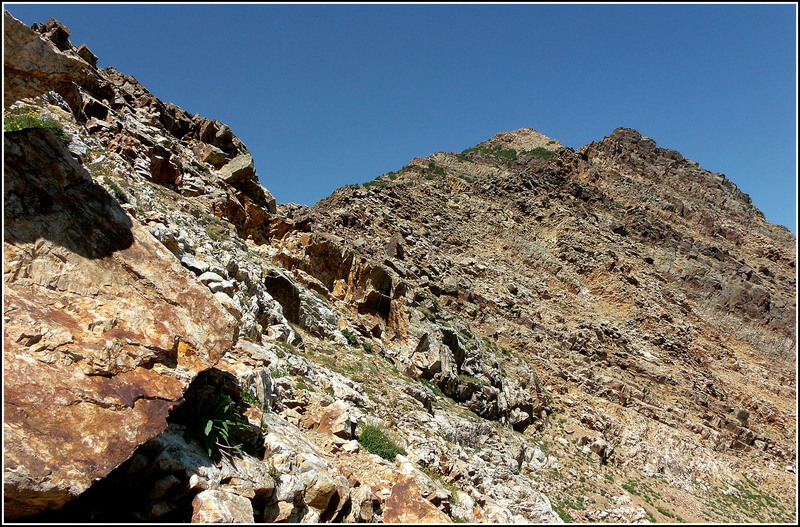 Those are the Oquirrh Mountains out there, the western geographical boundary…and that lighter-colored, damnable open-pit mine is toward the right edge of the mountains. 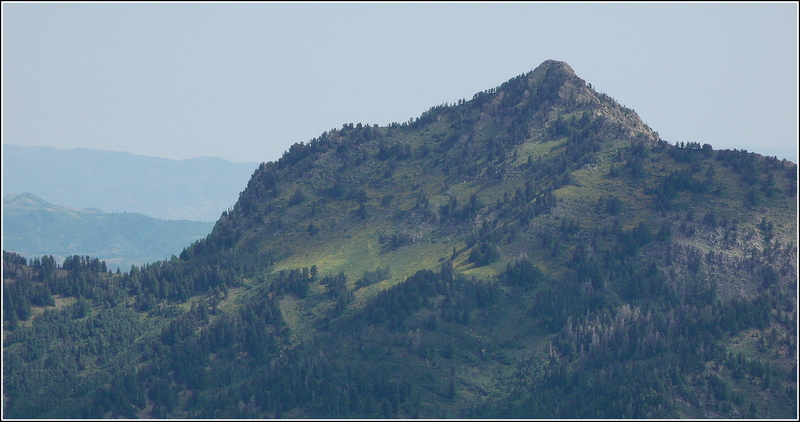 and the Lone Peak ridge…. …and now a self-portrait looking toward the east again…with that beaver pond from the earlier photo…a little bit above the tip of my boot…waaaay down there. 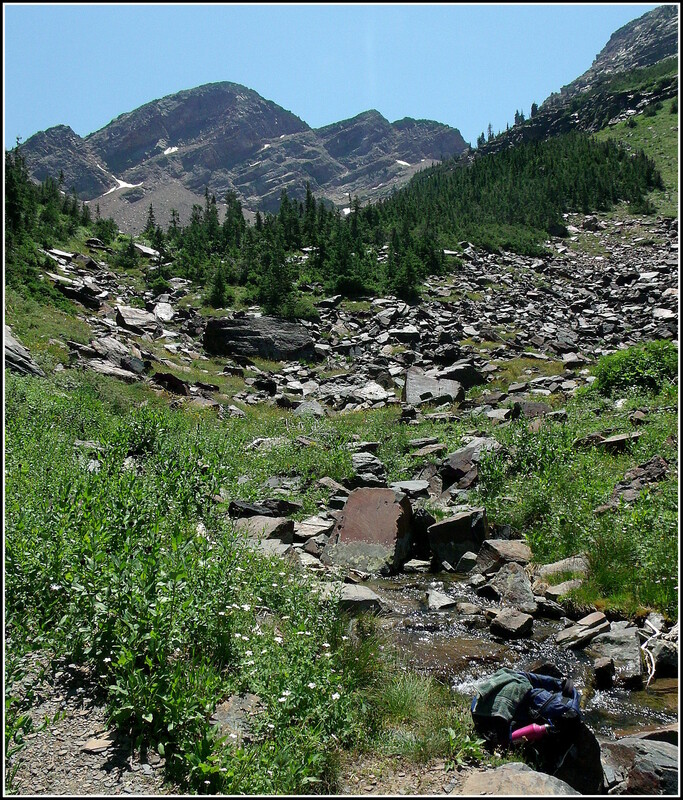 After the slippery and slow climb back down from the saddle, it was nice to make it to the spring again…such clean and cold and refreshing water. I refilled my two empty bottles and headed on my way. One last look at Broads Fork Twin Peaks before climbing a small, final rise and then hiking down the remaining three miles of trail back to the truck. 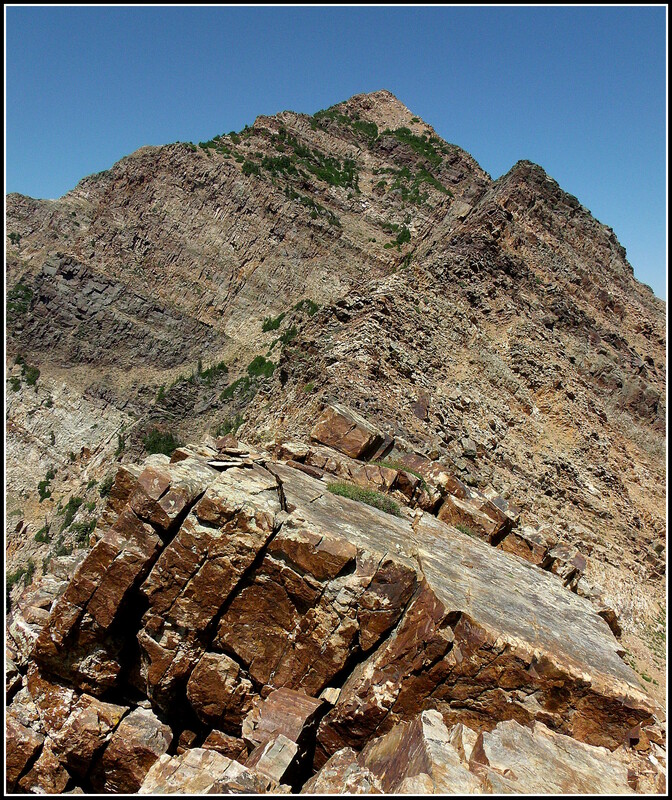 If you’d like to read more about Twin Peaks and the various ways one can reach the summits, you can click right here to be taken to Summit Post, one of the leading web-sites for climbing and hiking enthusiasts…not just for Utah, but for all over the world…. If you’d like to see where Broads Fork and the Twin Peaks are located on the map I recently shared on the blog, click here, and then find the second yellow pin up from the bottom of the map in the first image…it’s just to the left of center in the photo…and then it happens to be the only yellow pin, also near the bottom, on the second photo. Also, as a reminder to help with orientation/direction, the view of the map is looking eastward up the canyons…so the right side of the map is toward the south, the left is toward the north, and behind you (not on the map) is toward the west. 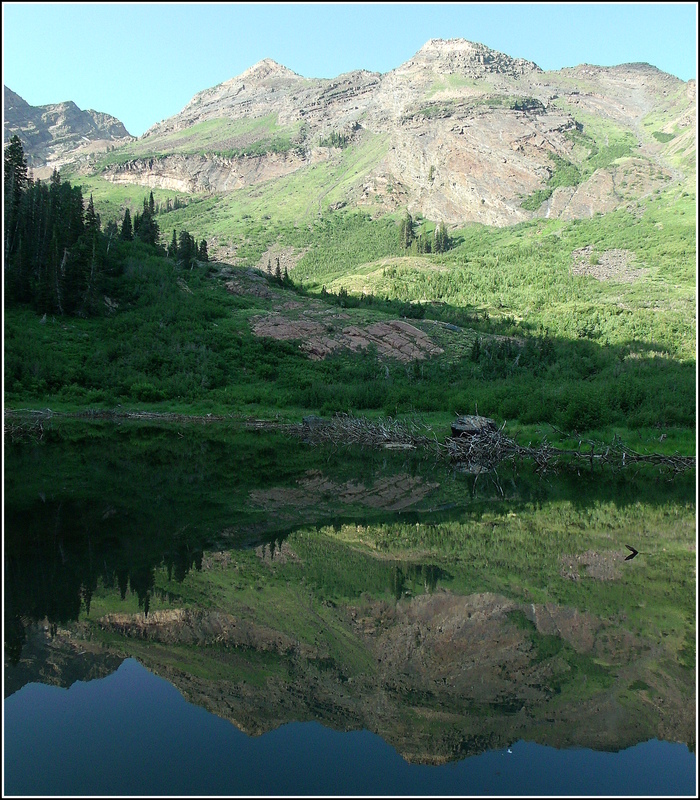 Thank you, yet again, for spending a bit of your time with me…for accompanying me on another hike into the Wasatch Mountains near Salt Lake City, Utah, USA. 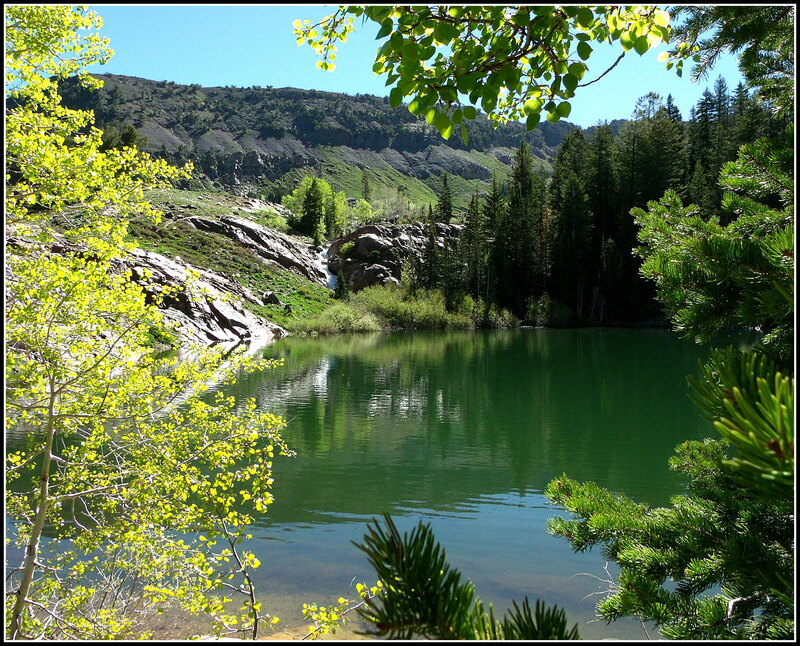 This particular location is found just down from the drainage at the lower and west end of Lake Lillian, one of the Sister Lakes in Big Cottonwood Canyon, just south and east of Salt Lake City, Utah.